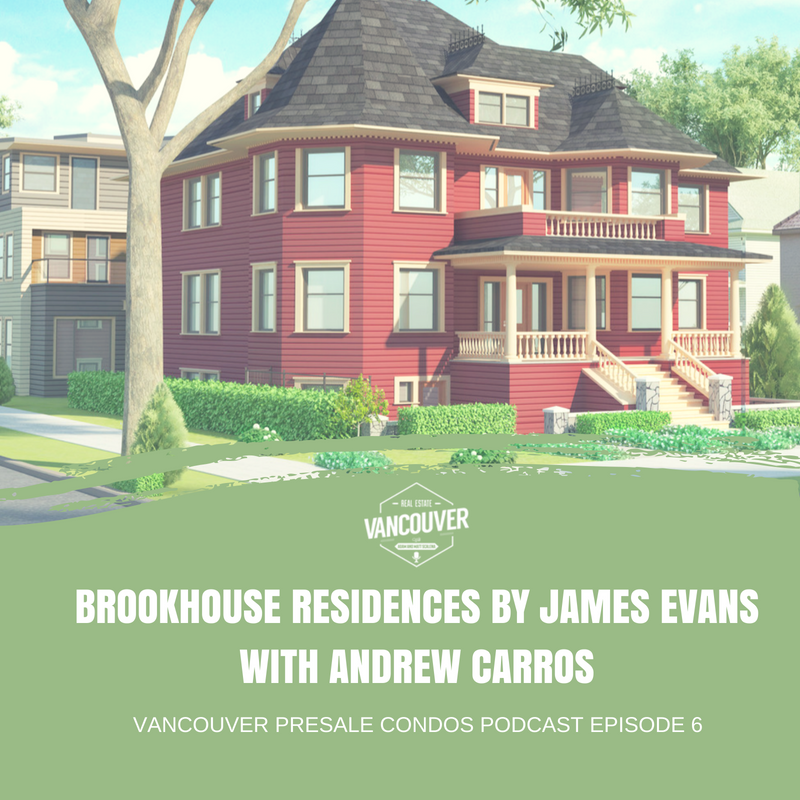 Brookhouse Residences is a collection of 10 brand new exclusive homes in a heritage building, coming soon to East Vancouver. Expertly crafted by heritage developer James Evans, these unique 1, 2 and 3 bedroom units seek to preserve as much of the original components as possible to accurately maintain the historical characteristics of the building. Andrew Carros, Partner at Engel & Volkers, sits down with Matt and Adam to detail this new and exciting project, expected for Summer 2018! This is a heritage restoration of a Queen Anne style home. The original house was built in 1908 and sits on the corner of Parker and Victoria, just off Commercial Drive. They’ve restored the main house by stripping it down to its main frame, moving it to a new foundation, and mimicking the home’s exterior to match how it was in its original construction. It’s now a collection of six apartments in the main house: two one-bedrooms, three two-bedrooms, and a three-bedroom penthouse. Additionally, there are four new townhomes in the back of the lot, all with three bedrooms, which is really valuable for Vancouver to have. This is exactly what the City should be encouraging more of. People really appreciate that Vancouver’s heritage is being kept, especially since there is not a lot of history here. It tells a good story. In the past, these homes would be knocked down and not retained. To encourage development of the property, the City added extra density to the lot, which will greatly help the area as supply is low. James Evans, the developer, did the Jeffs Residences which is a landmark development with townhomes around the corner. People were first concerned about the density,but are now ecstatic about this development. Andrew lives near Trout Lake and has been in East Vancouver for almost 13 years. It has suchnice diversity with the people, long-term residents, and families. It’s a bit more affordable and more space is available than downtown. The community is really proud and like-minded. There are many sports fields and facilities. People want to volunteer; it’s a very local crowd. About 90% of interest is from end-users: typical of this location are people with young families. One bedrooms will get some investment opportunity as there is a need for rentals, too. • Townhomes are all three-bedrooms with 2 or 2.5 baths and attached garages. They are listed from $1.15 million to $1.2 million, and are all over 1,200 square feet. • In the main house, the two-bedrooms range from $849,000 to $900,000, and are from 800to just over 900 square feet. • One-bedrooms are $599,900 and 600 square feet. So, they come in under $1,000 per square foot, which is affordable for Vancouver. Strata fees work out to $0.37 per square foot, and a fully-managed company will be taking care of maintenance. This speaks to the conservative nature of the developer and wanting to ensurepeople are getting exactly what they’re buying and being well-represented. Can you tell us more about James Evans and his work? James cares about the area, so has found these homes and made them his projects; he takes a lot of pride (Andrew is not sure if heritage will be his only focus). He has completed other heritage projects around the city and knows what he’s doing. He collaborates and has a good relationship with the City. He doesn’t just take the home and re-do the exterior, but divides the house up well into really useable, great floorplans. The penthouse is the belle of the ball, with many different angles and rooflines—it’s very special. Using the actual shape of the home is the trick; they can’t even move windows from the original home. They are targeting early summer this year, which is still on track. They guessed May 31 earlier and are only about a month behind—it should be completed by late June or early July. If someone out there is on the fence, why should they buy at Brookhouse Residences? 2. The heritage home is very unique and the curb appeal and detail is amazing. The history of what was is saved, and something new for the future is created. This is very exciting. 3. A somewhat affordable property with thee bedrooms, parking, and just space. 4. It’s really well built from a trusted developer who lives in the neighbourhood and cares about his neighbours. It will be a great community.